Boat-tailed Grackles are hard to miss anywhere in the coastal Southeast, and throughout the Florida peninsula. They’re huge, and saunter about with ridiculously long tails, whether they’re in a grocery store parking lot, a marsh, or Walt Disney World. The rich, dark-brown females are half the size of males and look almost like a different species. 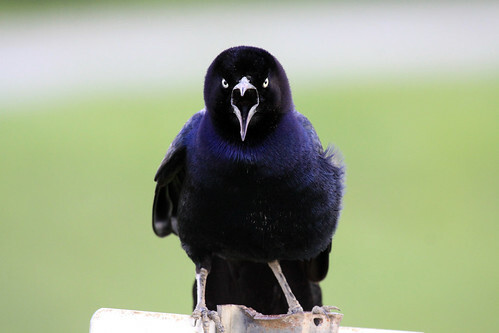 Boat-tailed Grackles take advantage of human activity along our increasingly developed coast, scavenging trash and hanging out in busy urban areas away from predators.